We are under way in the North Atlantic, between Cape Cod Bay and Massachusetts Bay. We had a nice three-night stay in Provincetown, Massachusetts, where we dropped the hook in 60' right in the middle of the bight (map). Not long after I last posted here, we steamed into the bight, rounding Long Point with its square lighthouse. The harbor was chock-full of boats, and we soon discovered that virtually every spot in the harbor in 20' or less of water (at low tide, which swings a full ten feet here) had a mooring ball in it. There was room at the edge for perhaps five or six boats, and it was already overfull. Plus a long dinghy ride to town. Provincetown Carnival. That's the historic Universalist Meeting House in the background; we went in and admired the trompe l'oeil sanctuary. We have 400' of chain, and after poking around the edge of the harbor we finally just decided to drop anchor in the 50' contour, a good deal closer to town. We put out 200' of chain for a bit more than 3:1 scope at a high tide of 60', with the nearest boats some 300' away, and called it good. We did have to chase away one sailboat that tried to drop in our swing circle the next day. Even though this was a busy week (more on that in a moment), there were quite a few empty moorings. 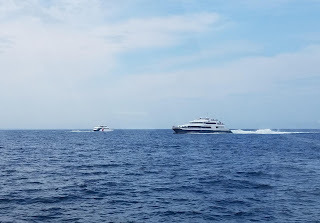 Frankly, I think the mooring outfits have put balls all the way out to the 30' contour just to force boats who would otherwise anchor to pay for balls. A mooring ball for Vector would have cost $91 per night. That would include launch service, but only to 6pm, and tipping the launch guys is also expected. We're very thankful for our heavy and long ground tackle. P-Town from our anchorage. 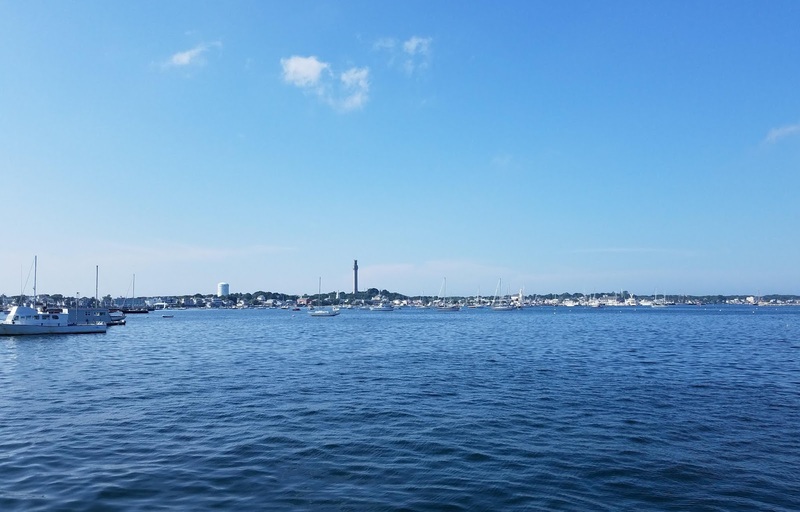 Pilgrim Monument at center; town dock and breakwater far right. Hundreds of boats. We splashed the tender and headed ashore for dinner, landing at the free town dock dinghy landing on MacMillan Pier. 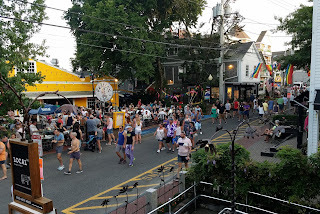 As we strolled down the main drag, Commercial Street, in the general direction of restaurants, we were suddenly transported back to New Orleans in Mardi Gras season: the town was decorated in yellow, green, purple, and gold, and masks, beads, and other Mardi Gras icons were everywhere. Hmm. 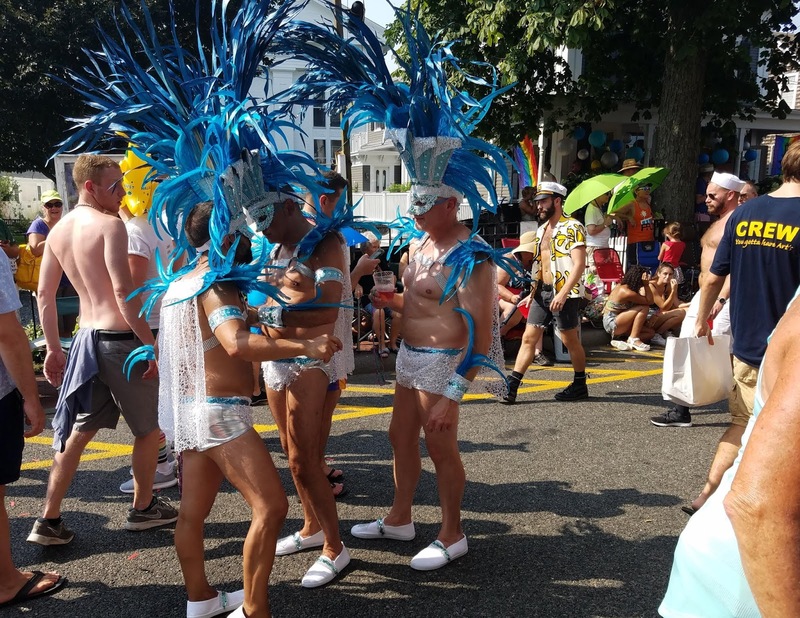 Fabulous head-dresses before the parade. After a couple of blocks we finally realized we had stumbled into Provincetown Carnival Week, the largest LGBTQ event in this uber-friendly town. 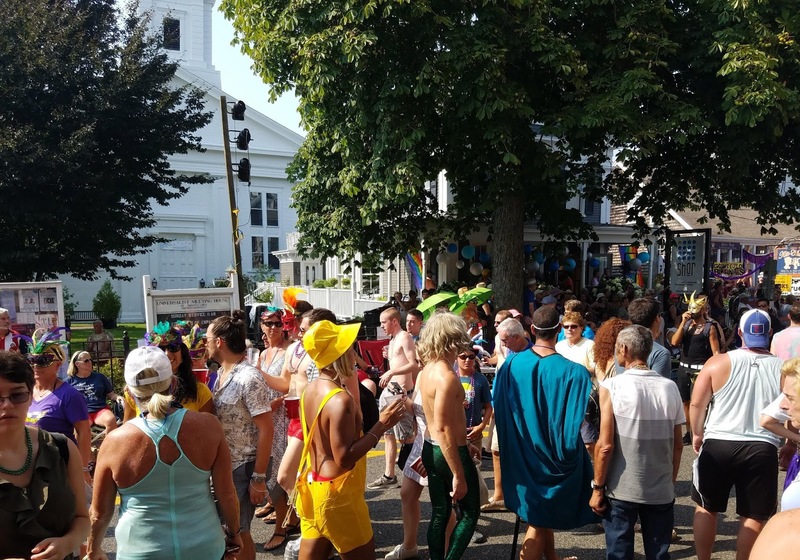 The local population of 3,000 swells to some 90,000 during the Carnival Parade, and lodging is sold out along the whole Cape. This explained why we found the anchorage so busy mid-week, when weekends are typically the busy time here. This year's Carnival theme was Mardi Gras Under the Sea. Happy to have ring-side seats for free, we continued wandering until we found a restaurant with an open table street-side. We had a great view from the patio at Local 186 of the happy festival-goers on the street. 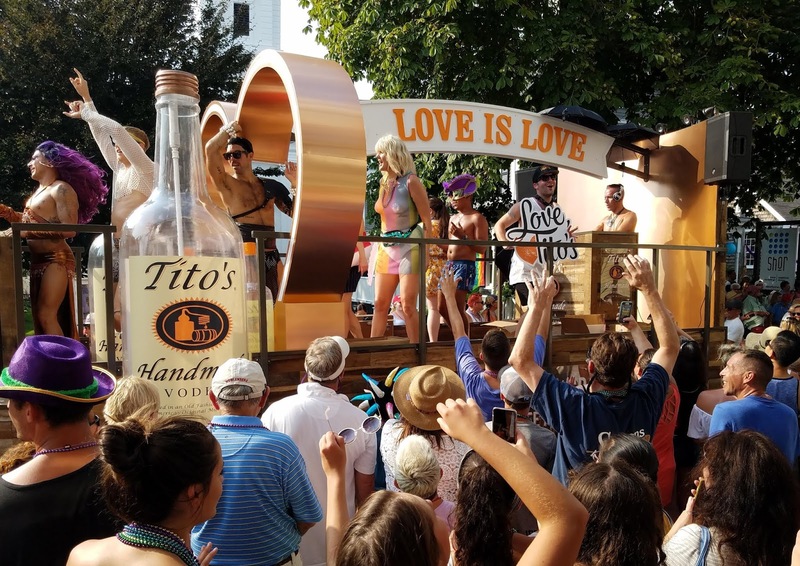 Out of curiosity I asked the waiter what our particularly well-situated four-top was going for during the parade and he said it was $400 and, like the rest of their tables, sold out. The view from our table at Local 186. Bubala's across the street has drag shows all season. 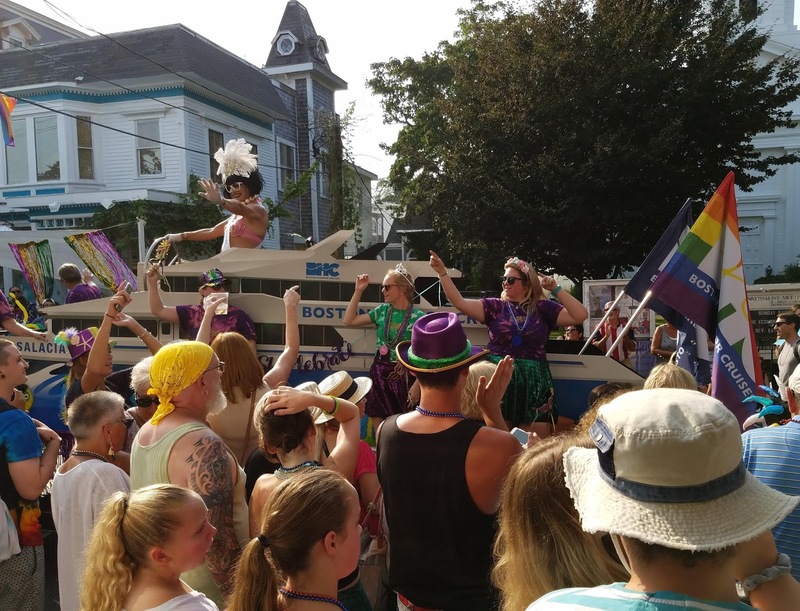 The parade was Thursday at 3:00, and, veterans of myriad Mardi Gras parades, we arrived ashore a bit after that to take up a position about half way through the route. We found a shady place to sit while waiting and taking in the happy festival atmosphere. The parade actually reached us around 4:30 and continued past us until after the scheduled end time of 5pm. Happy crowd even before the parade arrived. 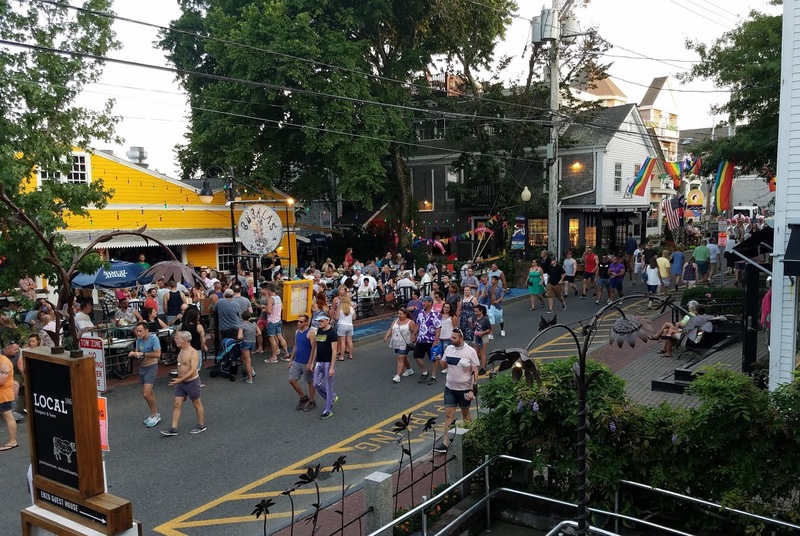 We made our way upstream through the crowd and scored a patio table near the street at Patio American Grill, which was festively decorated in feather boas for the occasion. Good food and even more great people-watching, both on the street and in the restaurant. We got back to Vector after dark and could hear the parties going on well into the night. We've been turning on the underwater light in the evenings, and were surprised to find thousands of squid. A squadron of small boats with powerful lights appears each evening, we assume to harvest them commercially. One morning I found a dead squid in the tender; we guessed he jetted out of the water into the boat. We also had a seal swimming around the boat periodically. Many corporate sponsors, including this expensive float from Tito's Vodka. Yesterday we went ashore in the morning to check out the combination chandlery and hardware store right on Commercial Street, after a nice brunch at local favorite Yolqueria. We were hoping to maybe find a new ensign staff (no luck), and I needed a piece of tubing to repair the turn signal on Louise's scooter. I also dropped three bucks on a sturdy cardboard box to ship a chartplotter I sold on eBay. Boston Harbor Cruises' float was modeled after their fast ferry Salacia that makes several runs here a day. We returned ashore in the evening for a final dinner at the Crown and Anchor, again scoring a street-side table on the patio. 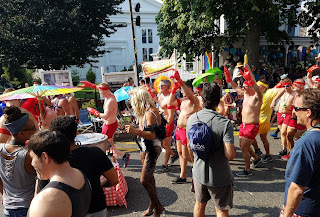 In addition to a restaurant, the Crown and Anchor hosts two of the more popular gay nightclubs in town, and we enjoyed meeting the producer of one of the shows while he was on the street drumming up business. We considered seeing the show but decided we did not want to be tendering back that late. 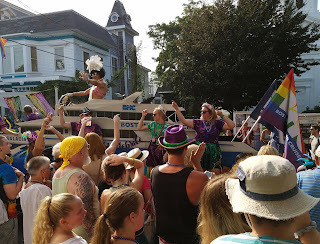 In all we had a great time in P-Town, in a way that was unexpected. Our friends Cherie and Chris over at Techmomadia call this "nomadic serendipity." We could easily have stayed another day or two, for the more usual weekend festivities, but incoming weather meant making this crossing today. 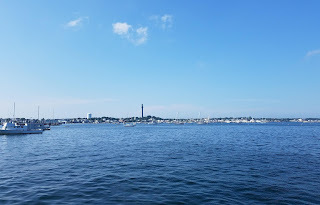 Passing the real Salacia, and the Provincetown III fast ferries. 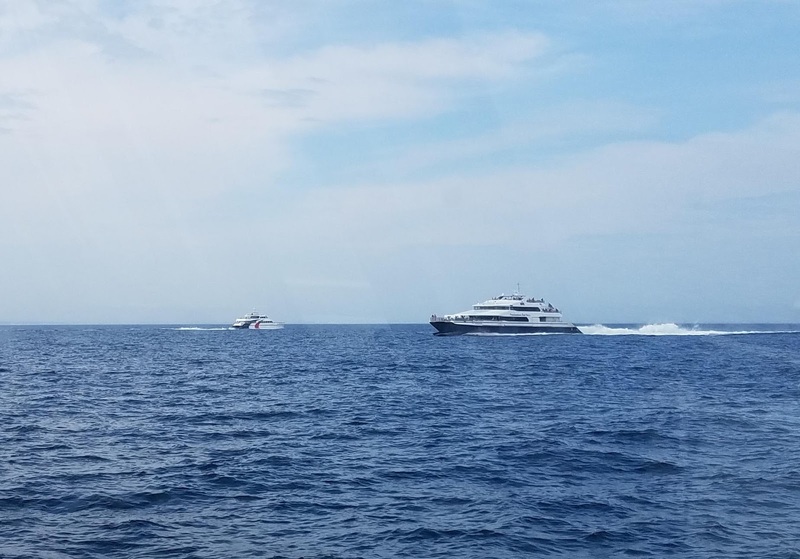 Salacia passed us three times today. In a short while we will round Minots Ledge Light on our way into Massachusetts Bay. We'll be turning south through Hull Gut and up the Weymouth Fore River to anchor. With any luck we will be able to look at a new tender at a Weymouth dealership on Monday. We're due in Portsmouth, NH Wednesday evening, so Tuesday we'll be heading north again.